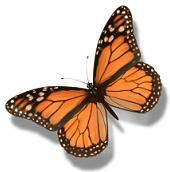 In early September as days turn cool, large numbers of beautiful black and orange monarch butterflies begin to flock. Many of these are in the far eastern provinces of Canada and others are in Alaska and western Canada. Then, as if there were some mysterious signal, each group takes off in a great cloud which becomes several miles wide and many miles in length. They have started a southern migration; those on the Atlantic Coast are headed for the Gulf Coast areas of Florida and Mexico; those on the Pacific Coast (for the most part) are headed for Pacific Grove, California. Each group has about 2000 miles to cover. One of the amazing things about this flight is that none of these butterflies has ever made this trip before, and there are no older ones to guide them. The "parents" of all these butterflies died while in the north. How, then, do they know the right time to leave; and how do they know where to go? How do these fragile insects, weighing so little, have the strength to travel so far, sometimes over mountains and across oceans? How can they stay on course in strong winds? None of this could ever happen if it were not for a Divine Power guiding and directing them. Their Creator provided them with the ability to make these migrations when He made them a part of His wonderful creation. Year after year He provides direction and strength to get them to their destinations. The certainty of the migration is so reliable that each year tourists flock to see it. After arriving, the monarchs spend quiet lives in the warm southern climate, living entirely on nectar from flowers. But as the wintertime passes, the urge to return is evident. Usually during June they migrate northward in great groups, returning to the areas they left the preceding fall. It is God who prepares these amazing creatures for their long journeys. Just as He has prepared them for their trip, He wants to see you prepared in the right way for the long journey awaiting you, too. The final destination for each of us is not to remain here on earth, but we must go either to heaven or hell. He who "is not willing that any should perish" wants you to accept His offer of salvation through faith in Christ and His work on Calvary, and go to heaven. When Christ comes back for those who have believed in Him, He wants you to be among those who shall leave this world "to meet the Lord in the air: and so shall we ever be with the Lord" (1 Thessalonians 4:17). How sad to know that those who refuse His offer of salvation will hear those awful words: "Depart from Me, ye cursed, into everlasting fire" (Matthew 25:41). Oh, may you know His loving and saving grace now, so that you will enter in and be part of those things "which God hath prepared for them that love Him" (1 Corinthians 2:9). See Part 2. Copied with permission from Messages of God's Love. More articles in The Wonders of God's Creation (Volume 1-4) by Sidney R. Gill, also published by Bible Truth Publishers.